Pauline set up her business, Awesome Paws Pet Care, to allow her to follow her dream and return to working with animals - having worked as a Kennel Maid for retired greyhounds in Surrey back in her teens! Having owned or worked with a number of animals over the years - including cats, dogs and other domestic pets, Pauline understands how valued pets are being part of the family. Giving up a career working for medical charities and health organisations in Central London, this allowed Pauline to be available the hours and days when clients needed the services of a pet care specialist and to undertake further training where required. A true animal lover, Pauline knew from personal experience that cats sometimes require additional help when it came to grooming. Having two long haired cats of her own, Pauline recognised the importance of keeping her cats hair healthy and knot free. 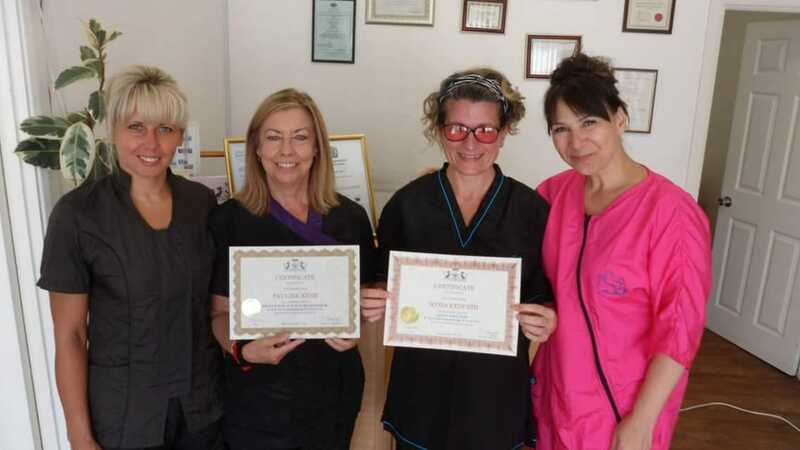 After researching who provided the best Cat Grooming training within the UK, Pauline made the decision to sign up to Svetlana Broussova’s highly regarded Cat Grooming School in London, UK and undertake extensive cat grooming training in a fully equipped cat grooming salon. 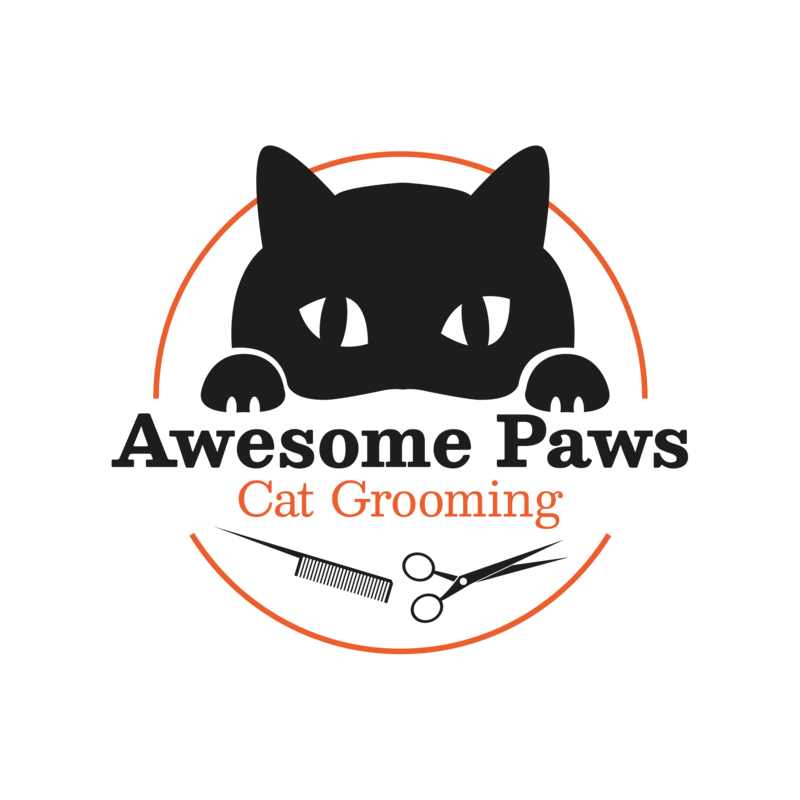 This lead to Pauline attaining the certification of Master Cat Groomer with the Cat Grooming School and expanded her pet care business to offer a mobile cat grooming service which she loves! Pauline is happy to discuss your cat grooming or pet sitting requirements, so please do contact us. Or telephone 07534 441810. We look forward to meeting you and your pets! For more about cat grooming, please see the Cat Grooming page. For more about pet sitting please see the Pet Sitting page. Pauline (second from left) with her Professional Trainers and a fellow student at the Cat Grooming School, London. Evidence of certifications and insurance can be provided. Pauline is honoured to be the official Cat Groomer of a local cat rescue, The Ginger Cat House Rescue, Worcester Park ran by an amazing lady June Fraser. June works tirelessly around the clock rescuing and supporting cats in need aiming to find foster or forever homes where possible, relying on supporters donations. For more information about this rescue, please see their Facebook page https://www.facebook.com/gingercathouse118/community/?ref=page_internal for more information how you can help.